I've had a few pieces of this BG dsp in my stash for quite a few years. It was left over from a paper pad and I had no idea how to use it, as it had text on a greenish-brown color with big printed "R" letters on it. I decided to make an origami tree by cutting it into smaller pieces, and I was happy with the way it turned out. I added a tiny snippet of embossed kraft cardstock for a tree trunk, then I placed it on a vanilla circle, die cut with a MFT stitched circle, and added a sentiment done in black. I used some gold glitter paper to punch the star which added just enough sparkle to make it feel more like Christmas. The background paper is another piece of BG from the same paper pad. I'm sharing this over at the Snippets Playground #199, while I'm adding it to my growing box of cards to donate to the "Caring Hearts Card Drive" going on from October 3rd to November 27th. Click the logo on my sidebar for all the details, and hopefully you can make a few Christmas cards to send in too! The cards are donated to nursing homes to bring a little cheer to the elderly during the holidays. Thanks for stopping by and make it a great weekend! Oh my gosh, Carol, this is absolutely gorgeous. I expect a lesson on how to do this, please! I know you know that I a low on paper... especially Basic Grey! LOL! Oh, my! I used to make these - a GREAT way to use up Holiday paper! Wow Carol, this beautiful card is so clever! Very original! The scrap of dp you used is just perfect to make the tree, it has some tones and shadow, fabulous! The white circle diecut make a perfect spot that catches eyes! what a great designed card, and lovely colour paper used. Snap great crafty minds think alike as I did a similar origami tree a month ago. This is snippets in perfection honey! OMG this week will be just too difficult for picks - Mr Random here I come ........... joke! Hi Carol, I love your paper folded tree set against the white circle. The DP is gorgeous, I love the beautiful muted colours and the gold sparkle star gives a nice festive finish. Sensational little Christmas tree! Wow! Love the paper you used for it too. VERY, VERY pretty and a wonderful use of snippets. Thank you for your visit!!! Happy you liked!! This Xmas card is gorgeous!!! What a fantastic job you did in making that tree. Just gorgeous and it looks very nice sitting on that circle. This will warm someone's heart as well as a smile to their face. Have a good weekend. 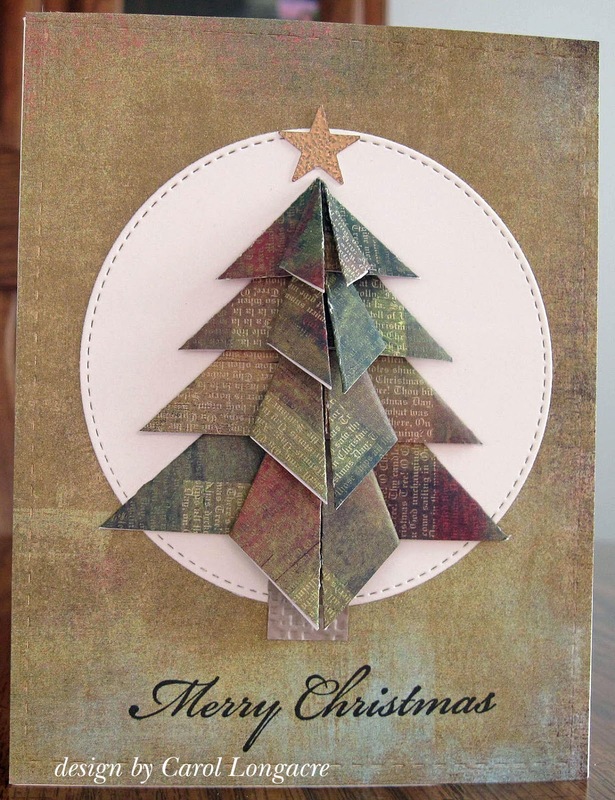 A fabulous card Carol, such a clever way to use your left over paper - your tree is brilliant. Great job with this tree! Been a while since I made one of these...You have definitely inspired me! This is a gorgeous card Carol. I love it!! Those papers look really awesome and I love the idea of using up those papers we never seem to quite get rid of!! :) The tree looks amazing!! This is a great tree. I've made these before and you just never know how they will turn out with the patterned paper. Very nice!